Human MOLT4 T cell line. 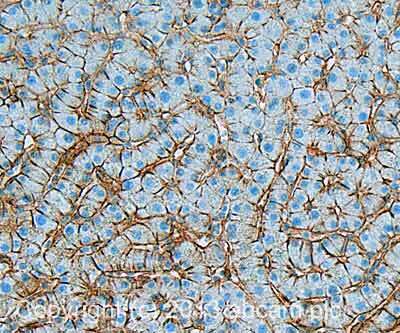 This antibody gave a positive result in IHC in the following FFPE tissue: Human normal liver. For Western Blot: Jurkat cell line Flow Cyt: HAP1-WT cells. ab79559 is purified from hybridoma culture supernatant by protein A affinity chromatography. Purity is > 95% (by SDS-PAGE). Our Abpromise guarantee covers the use of ab79559 in the following tested applications. WB Use at an assay dependent concentration. Use under non reducing condition. Predicted molecular weight: 26 kDa. Functional Studies Use at an assay dependent concentration. In human MOLT4 T cell line ab79559 inhibits syncytium formation induced by coculture with human T-cell leukemia virus type 1 (HTLV 1)-positive human T-cell lines. Overlay histogram showing HAP1 wildtype (green line) and HAP1-CD81 knockout cells (red line) stained with ab79559. The cells were fixed with 4% formaldehyde (10 min) and then permeabilized with 0.1% PBS-Triton X-100 for 15 min. The cells were then incubated in 1x PBS / 10% normal goat serum to block non-specific protein-protein interactions followed by the antibody (ab79559, 1µg/ml) for 30 min at 22°C. The secondary antibody used was Alexa Fluor® 488 goat anti-mouse IgG (H&L) presorbed (ab150117) at 1/2000 dilution for 30 min at 22°C. 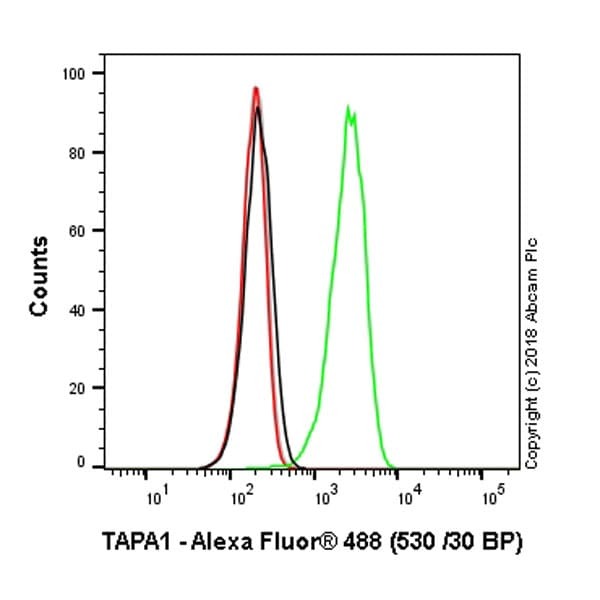 A mouse IgG1 isotype control antibody (ab170190) was used at the same concentration and conditions as the primary antibody (HAP1 wildtype - black line, HAP1-CD81 knockout - grey line). Unlabelled sample was also used as a control (this line is not shown for the purpose of simplicity). This antibody can also be used in HAP1 cells fixed with 80% methanol (5 min), , permeabilized with 0.1% PBS-Triton X-100 for 15 min under the same conditions. 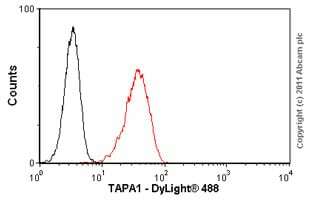 Overlay histogram showing MOLT4 cells stained with ab79559 (red line). The cells were fixed with 4% paraformaldehyde and incubated in 1x PBS / 10% normal goat serum / 0.3M glycine to block non-specific protein-protein interactions. The cells were then incubated with the antibody (ab79559, 1µg/1x106 cells) for 30 min at 22°C. The secondary antibody used was DyLight® 488 goat anti-mouse IgG (H+L) (ab96879) at 1/500 dilution for 30 min at 22°C. Isotype control antibody (black line) was mouse IgG1 [ICIGG1] (ab91353, 2µg/1x106 cells) used under the same conditions. Acquisition of >5,000 events was performed. 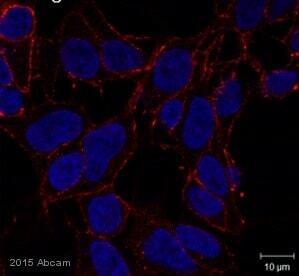 This antibody gave a positive signal in MOLT4 cells fixed with methanol (5 min) used under the same conditions. IHC image of CD81 staining in Human normal liver formalin fixed paraffin embedded tissue section, performed on a Leica Bond™ system using the standard protocol F. The section was pre-treated using heat mediated antigen retrieval with sodium citrate buffer (pH6, epitope retrieval solution 1) for 20 mins. The section was then incubated with ab79559, 5µg/ml, for 15 mins at room temperature and detected using an HRP conjugated compact polymer system. DAB was used as the chromogen. The section was then counterstained with haematoxylin and mounted with DPX. 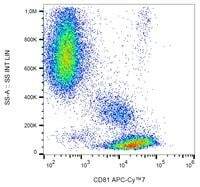 Flow cytometry analysis using human peripheral blood cells with ab79559.